Posted 3 Feb 2014. Last updated 5 Feb 2016. One side of monitoring that is difficult or expensive in the Windows world is performance monitoring. Windows comes with Performance Monitor, but that is only useful for short term monitoring or for troubleshooting a live performance problem. If you want to keep historic metrics, you might use something like SCOM, but it can be expensive and is a fairly complex product. There is a tool that has been around for a few years in the Linux world called Graphite. This is a very simple, but powerful metric collection system which used to store and render time-series data. You can find out more about it at the Graphite website. There is also an excellent blog post which introduces you to the baisc concepts of Graphite here: http://matt.aimonetti.net/posts/2013/06/26/practical-guide-to-graphite-monitoring/. The problem I faced was there was no way to get Windows Performance counters over to the Graphite server. There were a ton of daemons which do this on Linux, but Windows was left out. In the environment I look after at work, my servers are all Windows, so I ended ended up writing my own PowerShell functions to do this collection and forwarding to a Graphite server. This is done over UDP to the metric collection daemon used by Graphite called Carbon. Here is an example graph which can be generated in a few clicks in Graphite. It received its metrics from my Graphite PowerShell functions. 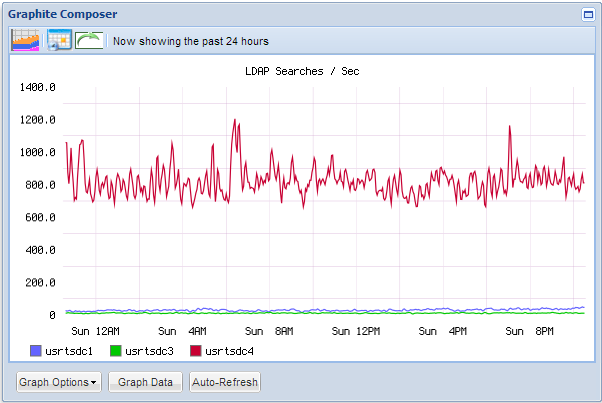 It is tracking LDAP searches against our 3 domain controllers for the last 24 hours. 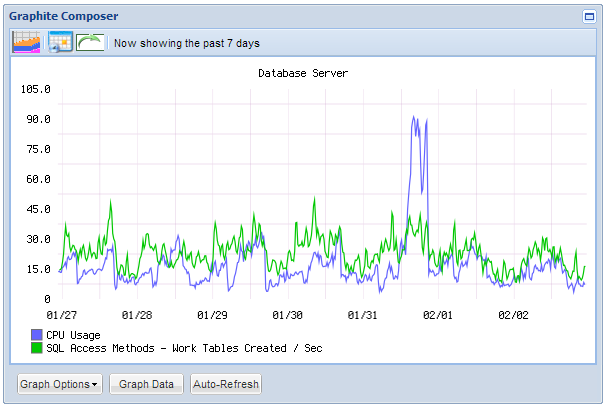 Another example, comparing CPU usage to SQL Work Tables Created on our database server for the last 7 days. First off, there is an XML configuration file where you can specify the details of your Graphite server, how regularly you want to collect your metrics, the metrics you want to collect, and any filters to remove metrics you don’t want (this is useful when you have multiple network adapters but only care about 1 or 2 of them that are connected). As you can see, it is very easy to add metrics which will be collected by the script. You can configure your MetricSendIntervalSeconds, which is how long you want the script to wait before sending the metrics to Graphite. Keep in mind it takes around 1.5 seconds to get the default metrics included in the script, so I don’t recommend you collect and send metrics more than every 5 seconds. The script includes a few internal functions which are used to getting metrics over to Graphite. All the functions have inbuilt help which you can access via the Get-Help PowerShell CmdLet. ConvertTo-GraphiteMetric -MetricToClean "\Processor(_Total)\% Processor Time"
If you wanted to manually send a metric on patch install so you can graph it against other metrics, you can use the following command, which will use the current date to create the metric. Start-StatsToGraphite – this is an endless While loop which collects the metrics specified in the XML file and sends them to Graphite. If you change the XML file while the script is running, the next metric send interval it runs through, it will reload the XML configuration file automatically, so any new Performance Counters will start being collected and sent through to Graphite. With the VerboseOutput configuration value set in the XML file, you will see the following output when you run Start-StatsToGraphite from an interactive PowerShell session. The script can also be run as a service, to make sure you don’t miss any metrics even if the machine reboots.